Spring is here! Whether you are jet-setting to your favorite spring break destination, or getting ready for the summer lake season, make waves in our top swimsuit styles. Right now, we are head-over-heals for the scallop swimsuit trend! These top swimwear picks from the Jessica Simpson line are right up our alley and the Ray-Ban Erika and Ray-Ban Arista Aviator styles help complete your look. Learn more about how we paired these swimwear styles below. Stop into your local SCHEELS and talk with a Swimwear Expert to find these styles, or shop all Jessica Simpson swimwear, here. Find more swimwear inspiration by following @ScheelsStyle on Instagram and show us how you wear your swimwear style! 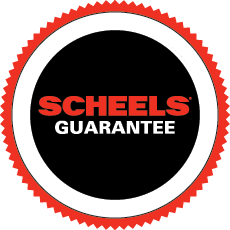 Tag @ScheelsStyle or #ScheelsStyle for a chance to be featured on our page. Add a little sass to your swimsuit with the scallop detail on this top and bottom! The bright coral color of this two-piece is perfect for sunnier days spent beach-side or pool-side. Your beach days will always be better when you’re in the Jessica Simpson Scallop Halter One Piece Swimsuit. Textured fabric and scalloped edges bring a sweet style to this solid bathing suit.